Search for the best flight prices from East Midlands to Palma, Majorca. Compare prices, book today and save money with East Midlands Airport. 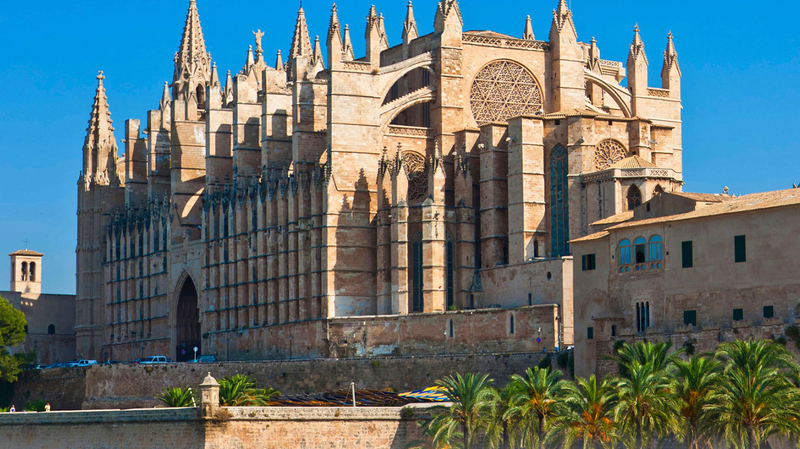 Anyone looking to explore pristine beaches and deep blue shores will find plenty in Palma. As the capital of the Spanish island of Majorca, it boasts a healthy mix of local development alongside natural beauty so travellers can enjoy the best of both worlds. The climate is warm all year round, with highs in the summer months, allowing you to visit at any time of year and expect the perfect combination of sun and sea. From budget to boutique, Palma de Mallorca has a host of fantastic accommodation. Gain a sense of traditional Majorcan chic at the Hotel Can Cera, a classy boutique escape in the Old Town. The classically styled Gran Mélia Victoria is a good top-end option in the city centre. For a real ‘wow factor’, head 11km out of the city to Castillo Hotel Son Vida. Set within a 13th-century estate, this opulent offering has obvious elegance and sweeping views of the bay. Those wishing to save their Euros need not miss out on the historical charm, however, with a stay at character-filled former palace Hotel Born. Most shoppers head straight for Avinguda Jaume III, Palma’s main shopping street where international names jostle for attention. But the tree-lined Passeig des Born is also a good place for luxury boutiques. Brands can also be found at the Porto Pi Centro Comercial, a shopping centre 2km from the centre. For more unique items and traditional Majorcan design, wander around the Plaça Mayor district, which has a weekly market and a plethora of independent shops. Nearer the port, Rialto Living Lifestyle Store is a treasure trove of interior design and art. Foodies will delight at discovering Mercat Olivar, a buzzing food market on Plaça Olivar. Palma has a range of bars and restaurants to suit most tastes, whether simple tapas or cutting-edge cuisine. Café culture is big in Palma, with the atmospheric Bar Bosch a perfect place to try ensaïmada, a coil of light dough sprinkled with icing sugar. For more substantial fare, sit down to a meal at Café C’an Toni, a lively eatery serving traditional Majorcan dishes, such as succulent roast meats cooked in its wood-burning oven. Another mid-range option, Restaurant Toque, serves Belgian-influenced cuisine. Among the most fashionable restaurants is Simply Fosh, a gourmet eatery in the Old Town. Also known as Darrers Dies, this carnival is celebrated at the start of Lent and features colourful floats, masked dancers and lively musicians in a lively procession along La Rambla. The largest parade during Semana Santa (Holy Week) sees different brotherhoods of the city hold aloft statues as they make their way to the cathedral. This glitzy show featuring millionaire toys, luxury yachts and humble boats encompasses all things nautical in Palma Marina. A feast of bonfires and fireworks signals the eve of midsummer in Parc de la Mersignal, an illuminating event that attracts both locals and visitors. This New Year celebration in honour of the Christian conquest of Palma in 1229 involves a popular parade from the town hall to the cathedral, where mass is held.